The Ramada Luling, Louisiana is Conveniently Located on Interstate 310 just off Interstate 10 at Exit 7. The Ramada Luling is Located only 25 Miles from New Orleans Louisiana. This Hotel Serves the Southern Louisiana Towns of Luling, New Orleans, Baton Rouge, Kenner, Metairie, Houma, Taft, Norco, La Place, Ama, Louisiana. The Ramada Luling is Conveniently Located Near The New Orleans International Airport, Ponchartrain Center, Alario Center, and Convenient to Downtown New Orleans. The Hotel is Within Walking Distance to Sushi Cafe. The Hotel is a Short Drive to The Esplanade Mall, The Audubon Zoo, The Aquarium of Americas, The University of New Orleans, Loyola University, and Tulane University. All of the Plantation Homes in the River Region and All Downtown New Orleans Attractions are a Short Drive. 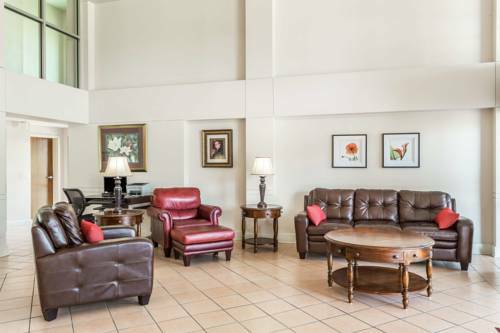 The Ramada Luling Offers Business Class Rooms, Free Expanded Continental Breakfast, Free High Speed Internet Access, Free Local Calls, Large Outdoor Pool, Exercise Facility, and Cable TV with HBO. Lots of local gossip from the local characters who show you around the swamp in a little boat.